Comprehensive, reliable, cost-effective solution for a tourist accomodation plunged in the sicilian nature. 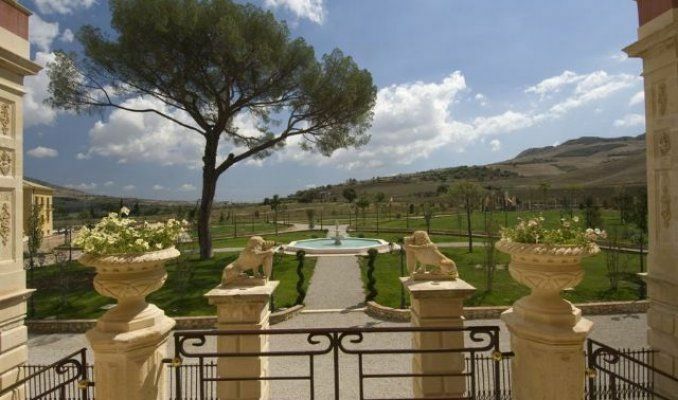 Villa Gussio Nicoletti is a luxury resort submerged in the hills surrounding Enna, with 13 hectares of garden, two swimmingpools, a spa and a conference hall, in addition to 23 suites and rooms. The customer requested a comprehensive solution for the park irrigation. The Hydro Tech ltd designed and implemented a cost effective solution, delivering water saving and remote control on a huge area. The resort is located on the countryside, submerged in a wide green area with trees, pathways and several golf courses. Out team followed up all design phases, giving technical and agronomical support. The system consists of a rainwater basin with a submerged pump drawing 5,7/6,2 liters per second. A disc filtration system filtrates water before its delivery to the irrigation system, thus avoiding impurities to damage all equipements and ensuring long operation. Irrigation is run by a sprinkler system with gear driven rotors. Irrigation scheduling is managed by an irrigation controller with 24 stations, for 24 electric valves and valve boxes. Part of the garden is also watered by a subsurface drip irrigation system. Our team designed the irrigation control room, traced the water conduits and the electrical system; also we provided the customer with a complete estimate. All equipments were supplied by the commercial division of the Hydro Tech ltd.